Vicki Voisin - The Paralegal Mentor with Paralegal Career Strategies: Regulation of the Paralegal Profession: NFPA Says YES! Regulation of the Paralegal Profession: NFPA Says YES! 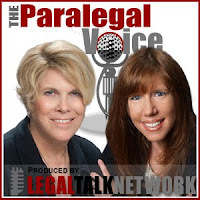 The latest edition of The Paralegal Voice, "Regulation of the Paralegal Profession - NFPA Says "Yes," co-hosted by Lynne DeVenny and me, is now available at Legal Talk Network. We welcome National Federation of Paralegal Associations (NFPA) leaders, Georgette Lovelace, RP and Tracey L. Young, RP. They talk about the benefits NFPA provides to its members, NFPA's position on regulation of the paralegal profession and its upcoming convention. These experienced paralegals also offer advice to listeners considering a paralegal career. The Paralegal Voice also thanks its sponsors: TERIS, Westlaw Deposition Services, and the National Association of Legal Assistants (NALA). If you enjoyed The Paralegal Voice, please share the link to the podcast with your friends and colleagues. Do you have a request for a future show or a question for us? You are welcome to contact us at TheParalegalVoice@gmail.com.